Though originally from Whiteville, NC, Cedric loves to travel all across the states, which he did regularly as a retail truck driver. In addition to that role, Cedric also has experience in everything from contracting to janitorial work, hands-on skills which he applies everyday to his work here at Smokingpipes.com. 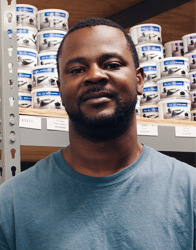 As one of our Shipping Associates, Cedric has become one of our go-to guys — from picking orders, to packing orders, and everything in between. When he's not at work, Cedric enjoys listening to music and spending time with his brothers and other family.